Rather than jumping right into the business portion of a team meeting, retreat or conference session, it can be extremely helpful to begin with an activity that “breaks the ice.” Such an exercise lightens the mood, gets everyone connected, loosens up tension, and stimulates energy and creativity. And although some of us might be tempted to roll our eyes or look for an escape route whenever we’re told to participate in an icebreaker, we would all probably admit that these exercises are indeed helpful in prepping groups for effective teamwork. So which icebreaker activities are the best? Which ones are fun, straightforward and appropriate for professional environments? Commonality: This exercise is done in small groups of 3-6 people. Each group is given 5-10 minutes to work together in identifying the most interesting things that they all share in common. They create a list of these commonalities, with a focus on the most interesting or unusual things they all hold in common. Once the time is up, the facilitator asks each group to report-out on their most interesting 1-3 commonalities. This creates a sense of friendly competition about which group came up with the most interesting, funny or unique commonalities. Sentence Starters: This activity utilizes incomplete sentences as prompts. Participants have to verbally complete the sentence from their own perspective. These sentences can be one of two types – either personal interest or work related. Some example sentences might be: “My favorite hobby outside of work is ___________,” or “As a kid, my original dream was to become a ___________,” or “My favorite subject in school was ___________,” or “The impact I hope our team will make is ___________,” or “What I love the most about our organization is ___________,” or “If our company were even more innovative, we might ___________.” For a shorter and more focused exercise, you can have everyone answer the same sentence starter. Or, for more variation, you can give every person a different prompt. For larger networking or conference type events, sentence starters can be pre-printed on name badges as a way to stimulate conversations that go beyond the surface. Mixed Bag Groups: This is a pretty straightforward and easy exercise for medium to large groups. As people enter the room, have them choose a piece of candy out of a bag. The type of candy they choose dictates which small group they’ll be a part of. This is a fun way to divide people into random groups and prevent people from self-selecting into cliques. Once everyone is in a group, they’ll spend 10-15 minutes discussing three pre-determined questions provided by the facilitator. These discussion questions can be personal in nature or relate in some way to the topics to be covered in the meeting, retreat or conference session. 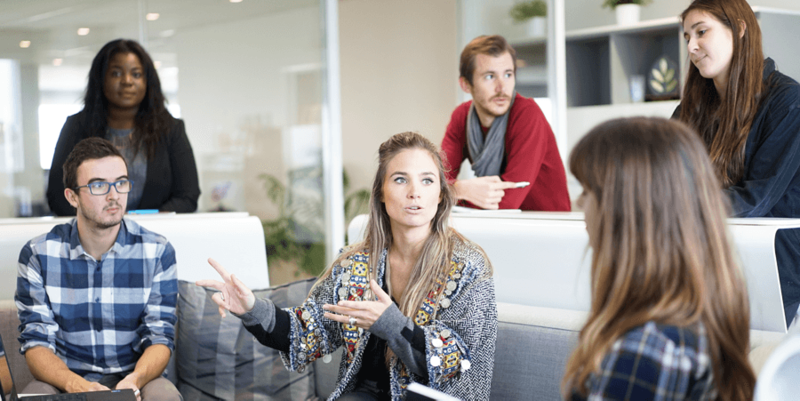 After the time is up, the facilitator can debrief the exercise by having each group share the most interesting or insightful elements of their discussion. Guessing Game: This activity is meant for smaller groups. To begin, each person in the team thinks of a fun fact about themselves that their team members probably don’t already know. This could be somewhere they’ve traveled, something interesting they did while growing up, or a hobby or special talent. Everybody writes their fun fact on a small slip of paper – without their name – and all pieces of paper are put into a bowl. The facilitator then pulls out one slip of paper at a time and reads it to the group. Everyone has to decide which person belongs to that particular fun fact. This continues until all of the slips of paper have been read aloud and matched with team members. 2 Truths and a Lie: In this classic game, each person on the team has to state 3 facts about themselves. The rest of the team has to guess which fact is the lie. In order to fool his or her teammates, each member has to come up with interesting true statements that could potentially sound like lies, and a false statement that just might be true. For larger groups, participants can be broken into smaller subgroups to play the game. Trading Places: This is a good activity for a group of 10 to 20 people. Everybody stands in a large circle, shoulder-to-shoulder, except for one person who’s standing in the middle of the circle. This person begins the exercise by stating his or her name (only if the team doesn’t already know each other’s names) along with one personal fact. This fact might be a favorite food, where they’re from, somewhere they’ve traveled, what type of pets they own, or how many siblings they have. Then, everyone who shares that fact in common has to leave their place in the circle and quickly find another spot previously occupied by someone else. The person who was in the middle also moves to occupy an open spot in the circle. Once everyone has moved to a spot, there should always be one person left in the center who didn’t get to a place in the circle soon enough. This person now begins the next round by stating his or her name and a personal fact. This continues for as many rounds as desired. Speed Convos: This is a very active and high-energy activity in which participants move from person to person in paired-off “speed networking” style mini conversations. For this activity, everyone stands up and pairs up with another person. Each person faces his or her partner. This is their partner for the first round, but their goal is to complete at least 4-6 rounds. The facilitator gives the instructions that each round should involve the following: a) A quick greeting, which might include stating each other’s name (only if the team doesn’t already know each other’s names) and sharing a handshake, b) An answer to the focus question (each partner gets his or her turn to answer), and c) A high-five hand gesture to close the round. The focus question can be a get-to-know-you type personal question, or it can pertain to a relevant business topic. Here’s the catch – for each round, participants have to give a different answer than they did previously. This is good for encouraging participants to explore a range of ideas, perspectives or options. Another rule is that there’s no question asking or discussion. Instead, each partner shares his or her answer while the other person only listens. This keeps rounds efficient, and encourages listening.